When I first joined Engineers Without Borders, the first thing that struck me was the incredible people I was working with: passionate, critical, tireless. The second was that I had found an organisation with values that so closely matched my own: questioning fundamental assumptions without sacrificing commitment and hard work. The third was the acronyms. EWB, ISF, R2EP, MOFA, G&RI, ERA, AAB, CEF, OP, FEPPA-B, UGCPA, KSA, WatSan, … I was introduced to these within a few weeks at most. So it was that, at my inaugural exec meeting with the McGill chapter, during a discussion about buzz words, I heard the name “Dorothy” mentioned for the first time. Everyone nodded in understanding and agreement; “Yeah, that’s a really big one,” someone murmured. “What kind of an acronym is that! ?” I wondered quietly alone, trying subtly not to reveal my complete ignorance. Dorothy, however, is not an acronym; she’s our boss. Dorothy is a subsistence farmer in rural Burkina Faso tending his millet fields and adopting better management practices to improve his family’s livelihood. She is a mother, pumping water, grinding maize, carrying wood and tending her own field, to make sure she can feed her children. Dorothy is both a concept and the real people for whom we ultimately work; we answer to her both as an organisation and as individuals. In reality though, to many volunteers, Dorothy is an actual person, a very personal connection that guides their work in Africa and their decisions back in Canada. Personally, I don’t know whether I can say that I have “found my Dorothy”. In truth, because of the way I think and am, Dorothy may remain more powerful to me as a concept than as a single person. That concept as a whole, however, is still fed by personal experience. The different people I met during my village stay in Kayero are constantly on my mind; they help me decide what constitutes “good development work” in Burkina and will doubtless help me prioritize my efforts back in Canada. Because they are important to me, I’d like you to meet some of them. Saïdou Tagnan in his living room, next to his motorcycle. You have already met Saïdou in my last post, but don’t yet know very much about him. Born the second of seven sons, Saïdou Tagnan has lived in Kayero for all of his 52-year life, with his four eldest brothers as neighbours (the other two have moved to the Ivory Coast). 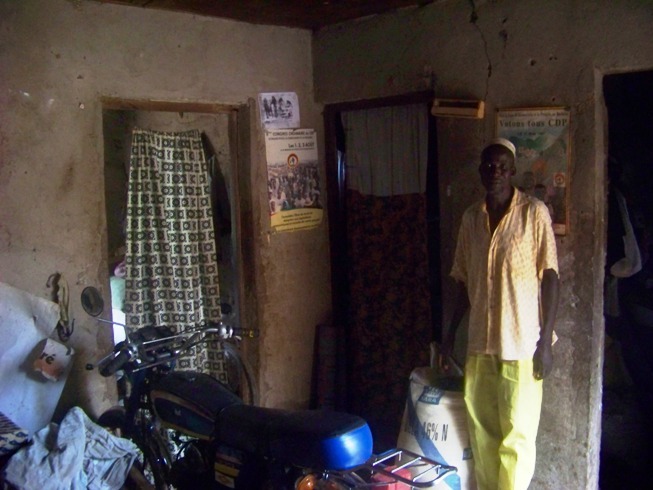 Saïdou is not the richest farmer in his village, but he is certainly one of the most well-known – and not just in Kayero. Being the departmental president of his farmer union, the FEPPASI (Fédération des Professionnels Agricoles de la Sissili), means he often has to make trips to neighbouring villages on his motorcycle to dispense or gather information. Active not only in the union, he is also the representative of the CDP (Conseil pour la Démocratie et le Progrès, the long-time ruling political party of Burkina Faso) in his department, and even acts as president of the department’s various elementary schools. His activities and age have afforded him a certain influence; when Saïdou speaks, people tend to listen. Saïdou was my guide, translator and host in Kayero, and offered me the best food available (including a chicken on my first night which I narrowly avoided having to slaughter myself), despite the 10 mouths that currently depend on him: his two wives, the six of his own children that still live in Kayero, and two young relatives in his care. 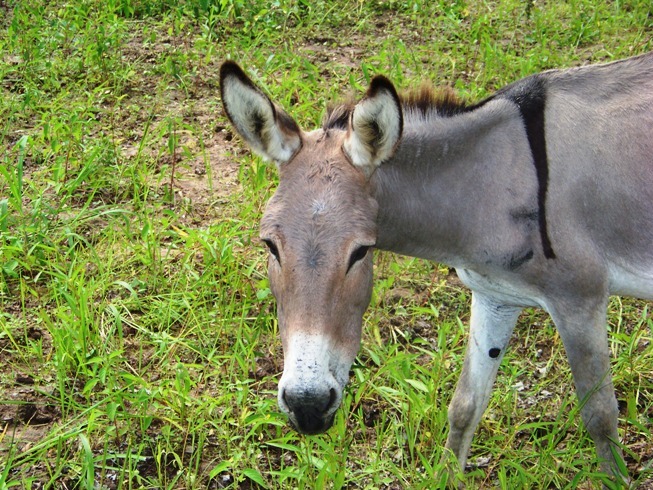 For now, Saïdou borrows two donkeys from his younger brother. As we walked through his height hectares of corn, cotton, millet and peanuts, Saïdou would always come back to the same themes: “I know things, a little bit. I know how to get good yields. I know how we should organize ourselves. I just don’t have the means.” In his mind, the means would, first and foremost, be two new oxen, to have a complete set of four, and a healthy donkey. Most of what Saïdou cultivates is for his family’s consumption. Cotton, however, is a cash crop. Like others in his village, Saïdou doesn’t like cotton: it’s hard work, it requires lots of fertilizer and he can never seem to get a good price for it. Unfortunately, he sees no way around it: cotton is the only way he can get money, and money is the only way he can send his children to school, buy medication and obtain those means he is after. The money, however, tends to run out after just the first two and a bit of gasoline. 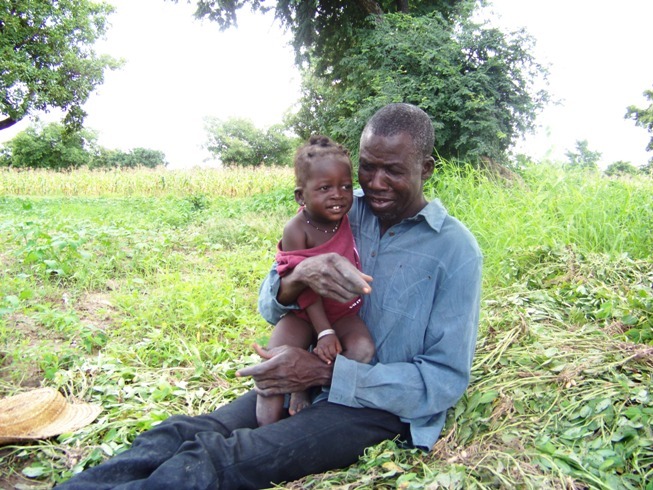 Saïdou with his youngest daughter in the peanut field. When I left the village, she had malaria and would throw up any medication administered. Saïdou spends only half of his time on the fields and the rest doing union work. Though it seems to come at a high personal cost, he thinks it is worth it. He believes that working together with other farmers to increase their market power – and perhaps eventually moving towards specialization – is the right choice, even if he may not benefit from it in his own lifetime. Saïdou isn’t necessarily an entrepreneur, of the type we hope to see many producers become, but his vision is undoubtedly turned towards the future, whether it be investing the funds he has in his children’s education or investing the time he has in the union. That went a bit longer than I anticipated, so I’ll wait to share a few more profiles in a future post instead of right now! How about you? Who are the people who motivate you to do what you do? In your life, who do you answer to, ultimately? This entry was posted in EWB & Development, Life, stories and comparisons and tagged development, dorothy, EWB. Bookmark the permalink. Really nice posts, it shows me a bit of a different experience from what I lived through as an expat in Mali. I want to share with you the story of my Dorothy, totally different story from yours but I guess they all are. It was my cook when I was in Mali, he was the nicest person and amazingly pleasant to be around. He made me survive my 12 hour days at the office and I even came back with extra weight cause of his yummy cooking. Compared to other Dorothys I assume he was well off, he had a salary and was somewhat able to take care of his family financially, until his daughter got sick with malaria. He asked to borrow money from me, I lent it to him and then he paid me back, obviously I refused, but he wouldn’t hear it. The day I left, my colleague and I wrote him a card and gave him a monetary gift cause he really deserved it and we judged it to be the best way to show our gratitude. He was barely able to read the card and as he read I fought to fight back the tears. Then he told me “I have been doing this for 20 years, have worked in embassies and with expats from all over the world and no one has ever done this for me”. I will never forget his words… and I will never forget him. Once again, great work Dana. That’s an amazing story Arian. Thanks for sharing. Enjoyed reading the post. Hope you are doing well Dana!